What Kind of Car Insurance Covers Flood Damage? Make Sure You Have This Auto Coverage If You Live in a Flood Zone? It might surprise you to know that auto insurance does cover flood damage to cars—as long as you've selected the right coverage on your policy. Yes, that's good news because a flood can easily total a car and the only way to get your insurance company to pay for the repairs or a total loss is to carry comprehensive coverage on your policy. Flood insurance can be crucial if you live in a high-risk flood zone. Comprehensive coverage is an election. It's not automatically a part of an auto insurance policy. It covers you if your vehicle is stolen, if a tree falls on it or if it's flooded in a storm. Comprehensive coverage is for damages that occur from something other than a vehicular accident. If you collide with another vehicle, that damage falls under the umbrella of collision coverage. You're most likely required to carry both comprehensive and collision coverage if you're financing your vehicle because it acts as collateral for your loan. The lender can repossess your vehicle if you default on the loan. It wants to make sure that it will be in working order when and if that occurs, so you're required to carry this coverage as a precaution. Technically, you can drop comprehensive coverage as soon as your last car payment clears the bank and you take title to the vehicle. But do you want to do that? Probably, if you live in a flood-prone area, but you'll want to do a little math to determine if it's worth your while. Carrying comprehensive coverage increases your auto insurance premiums. How much is your car worth? Would it be less expensive to replace it if it's totaled? It is particularly a consideration if you're driving an older car without much value. Insurance companies typically restrict the purchase of comprehensive coverage if a hurricane is on the way and your vehicle is located in an area that's in the hurricane’s path. You won't want to wait until a hurricane is forecast to purchase comprehensive coverage. This restriction prevents fraudulent claims by people who want to pay for the coverage for just a few days in the event of emergency versus always carrying it just in case. Call the claim in immediately. Time is of the essence when you're reporting a flood damage claim. Contact your insurance company directly as soon as possible if your insurance agent’s office is not available. You want to be first in line to get your claim processed, especially in a catastrophic situation. 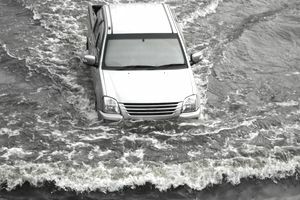 Do what you can in advance to protect your vehicle against flood damage. Identify the risk level for a potential flood in your area and weigh the value of your vehicle against the cost of comprehensive coverage. Speak with your insurance agent to determine the best coverage for you and your family.